Method:- Do not peel apples or zuchinni- Slice both and place in a bowl- Mash fresh Rosemary with salt, pepper and olive oil.- Add vinegar and mix with fork.- Add walnuts- Pour dressing on sliced fruit and vegetable and nuts.Serve cold. Sonia Rumzi is creator: stories (her debut novel ‘Simple Conversation‘ made the Amazon/Kindle’s Best Seller list for Women’s fiction), paintings, photographs, food…..the list goes on. For me, Sonia Rumzi’s brilliance comes from her no-nonsense approach to life – you’ll find it reflected in her writing (and in her salads!). Over the last few months that we’ve connected, Sonia has been kindness personified to me. Today I’m so happy to be able to share one of her creations with you. 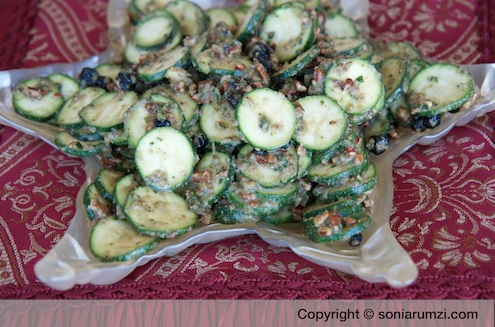 Thank you, Sonia – and not just for this recipe!